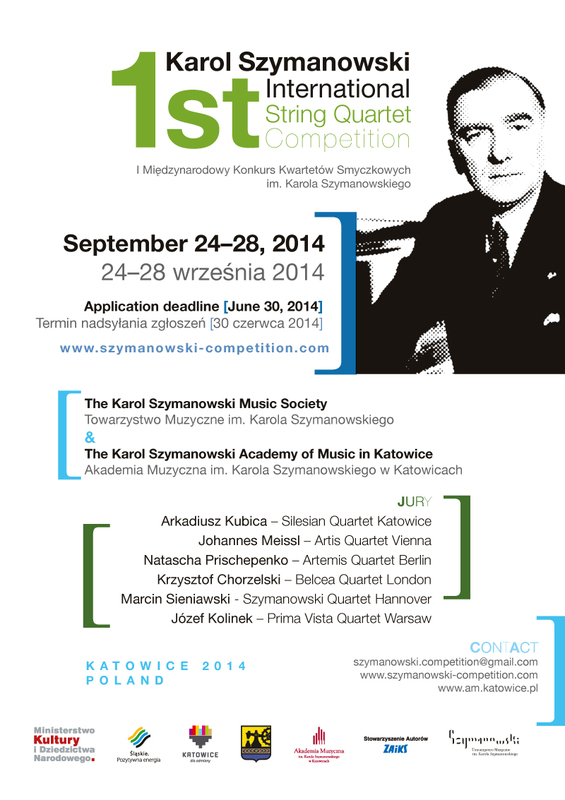 After succesful Composers’ Competition announced in 2012 to commemorate 130th anniversary of Karol Szymanowski’s birth (176 participants from all over the world took part) the Society has announced 1st International Karol Szymanowski String Quartet Competition 2014. The required repertoire contains String Quartets by Karol Szymanowski as well as quartets by Andrzej Panufnik ( to commerate 100th anniversary of birth of this Polish composer) and other prominent European composers of the 20th century. The Artistic Director of the Competition is Arkadiusz Kubica, member of the Executive Committee of the Society as well as violinist of Silesian String Quartet. Others members of jury are the representatives of renowned European quartets as Artis Quartet Vienna, Artemis Quartet Berlin, Belcea Quartet London, Karol Szymanowski Quartet Hanover. Competition will be held under the patronage of The Ministry of Culture and National Heritage of the Republic of Poland, The Governor of the Silesia Voivodeship - Mirosław Sekuła and The President of the City of Katowice - Piotr Uszok.